Joy by Jean Patou, released in 1930, was busy being the most expensive perfume in the world during a time when a lot of people didn’t have much. It intrigued individuals for years who wondered what was in this magical juice that made it cost so much. These days, Joy is still pricey but no where even close to the most expensive perfume in the world anymore. Thank goodness. In Bottle: Roses. ROSES in all caps even. Joy starts out with a huge blend of roses layered heavily on top so that barely anything else can be discerned past this rose force field. Applied: Roses still in the forefront but let it age a bit and I can smell the jasmine. It’s a gorgeous, full, heady jasmine that intermingles so well with Joy’s rose bouquet that the entire mixture has this bright, happy, scent to it. As the rose continues to calm down tuberose comes up to join the party. The florals remind me of a big bouquet, resting in a vase on a sunny day. Joy is what a perfectly paced perfume smells like as it evolves and morphs into this pretty flowery thing. This smells like optimism. Glorious, well-blended and well-made optimism that dries down eventually into a dusty sandalwood with a surprising presence of indole (our friend civet!) at the very end. Extra: A part of me still wishes Joy held its title as the most expensive perfume in the world. It’s name is Joy after all. Instead, if you ask someone what the most expensive perfume in the world is, they’ll tell you it’s Clive Christian’s Imperial Majesty. A baccarat cased perfume that’s supposed to push for $215,000. I doubt that’s worth the price of admission. Design: Classic, elegant, simple bottle design. Joy has a nice weight to it and its simple, clear glass, plain label look reminds me of Chanel’s bottle design, but no where near as minimalist. It works and it will continue to work for many years. You simply can’t go out of style with a bottle that looks this classic. Notes: Rose, ylang-ylang, aldehydes, pear, tuberose, jasmine, orris root, musk, sandalwood, civet. I think the question that remains is whether or not Joy was worth the hefty price tag it once sported. My answer? Well, not the juice, certainly the novelty of owning and using the most expensive fragrance in the world would be worth it for some people but I’m a bit more practical and think Joy’s present price point suits it well for the kind of scent that it is. As for that $215,000 thing we’ve got now? I’m curious but mostly apathetic. What juice could possibly be that good? Besides, most of the price tag has to do with packaging the thing. 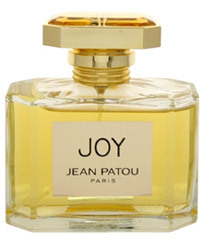 Reviewed in This Post: Joy, ~1980, Eau de Parfum. This entry was posted in classic, floral, jean patou, Reviews By House and tagged aldehydes, civet, jasmine, musk, orris root, pear, rose, sandalwood, tuberose, ylang-ylang. Bookmark the permalink. This fragrance can bring you the Winter night alone I would not use it for much more.